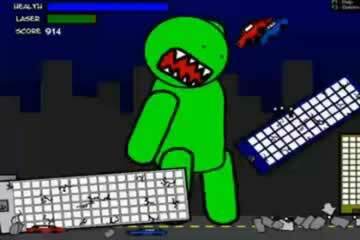 Crush Game - Download and Play Free Version! Destroy as much of the city as you can before the local military forces can stop you! Find addicting fun by CRUSHING the city! The sun is shining outside and you are sitting at your computer wondering what to do today. 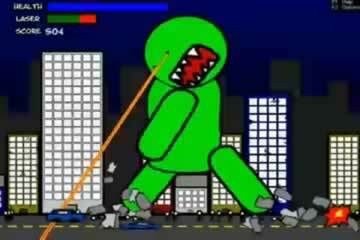 Why not destroy the city with a giant monster you control. I know, you should probably enjoy the sunny day... but this is addicting fun! Pick up cars, use laser eyes, even pick up buildings! Smash and crush everything along your path. The military and police will try to stop you... feel free to crush them too! Again, the only limit is your imagination! The more you destroy, the better you do! Are you the best? Compete with others by comparing scores! Crush has an online scoreboard where you can ascend to greatness by having the best score! You can see how you are doing against other players around the world. Whoever has the highest score gets the prestigious "best player in the world award." Could this be you? There is really only one way to find out. Download the game and play and see how you do! 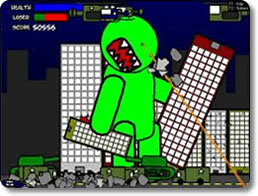 Hint: Press F1 once you start the game to learn how to control your monster and terrorize the city! Catch a peek at the destructive gameplay you can enjoy with Crush.